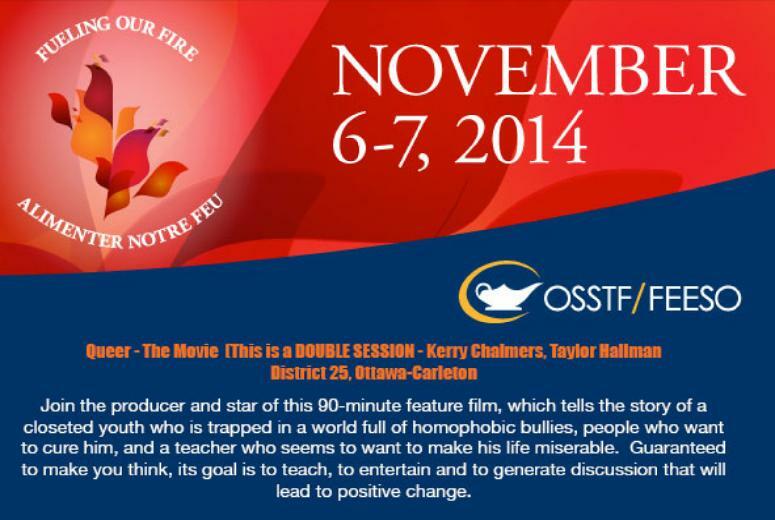 November 7th 2014, Kerry Chalmers, the Producer, and Taylor Hallman the Star of Queer presented a 3 hour workshop to approximately 60 educators at the OSSTF Fueling Our Fire conference in Toronto Ontario. The intent of the workshop was to introduce the film to education and to demonstrate an approach to using it in schools as a tool to initiate discussion about LGBTQ issues. The response from the attendees was very positive with many being very vocal about how it would be a great tool, particularly for workshop-based initiatives where there would be sufficient time to deal with the numerous discussion items that the film would generate. There were requests for an education-specific version of the film. No one had specific issues with any of the content, however, they felt that some scenes, and the depth of content on some issues might be of concerns to administration. (An educational version of Queer has now been released under the name "I'm Just Me") They also requested that the slides used in the presentation be made available to educators for their workshops. Attendees were also very interested in discussing Taylor's role in the film, his background and wanted to know if he or other members of the cast would be available if they presented it at their schools.